This is the original pond. It is about eighteen inches deep, four foot wide, and not quite six feet long. Created back when I still had a shred of sanity it is small and decorative, and maybe a little boring in the picture since it just thawed out from a long winter. There's only one problem and you are probably looking at it: fish. 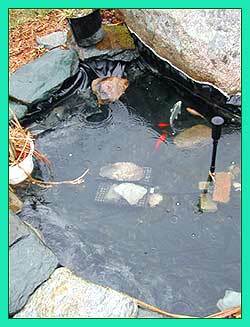 The pond wasn't deep enough to sustain fish through long New Hampshire winters, which meant bringing them inside for four months. The fish kept growing and each winter we got a larger fish tank to house them. When a forty gallon tank became too small I decided it was time to expand the pond. Like any other house and yard project it kind of "grew." At first I planned to dig a couple feet deeper, make it a little wider and longer, and that's about it. Oh, maybe a new pump and filter since crawling into the pond to clean the filter every few weeks really was getting to be a pain. Meanwhile other yard projects were being planned and one of them ended up right next to the pond. We were making walking paths and little gardens around the house perimeter and, dang, wouldn't the pond look really nice enveloped in a diverse ecology of its own?